We recently performed a wedding gown restoration for this beautiful shantung silk wedding gown, with removable train, and veil. 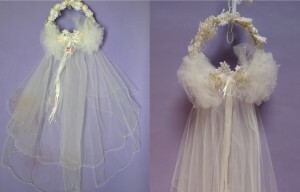 The wedding dress had beautiful pearl and sequins on the neckline, waist area and hemline as well. It was worn in 1995, so it was not very old, but was in desperate need of restoration. The wedding dress was evenly yellowed but had large oxidized stains on the front and on the sleeves. Some of the pearls were damaged and the veil had some rust on the head piece frame. 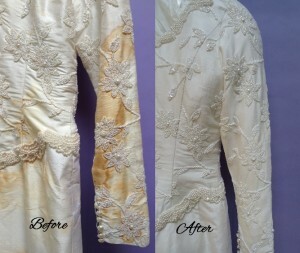 Our wedding dress restoration process included hand cleaning and a chemical whitening soak. The veil was also hand cleaned and chemically whitened. After the wedding dress was restored with this treatment, the wedding gown and veil were hand pressed and preserved with Museum Method™ preservation. 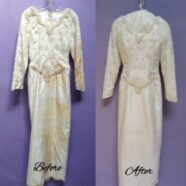 We did everything we could for this wedding gown restoration without risking the safety of the wedding dress. The results were good, if not perfect. The oxidized stain did not come 100% out but the overall results of the restoration were excellent and our customer was thrilled. She wanted her wedding dress restored so that it could be enjoyed by herself as well as her posterity. You may want to read some of our Wedding Dress Preservation Reviews or learn more about our Vintage Wedding Dress Restoration process. We also have a video of Vintage Gown Restoration and Antique Wedding Dress Restoration Before and After photos you might enjoy. Scroll down to bottom of page for the video.